The boat passed under an attractive slender bridge. Here a modern highway crossed over a much, much older one. Early Malay civilization was based along coastlines and navigable rivers, but I had never experienced this in a personal way until today. I'm on a 90 km river trip down the Siak River in the Riau Province of Sumatra, from Pekanbaru (literal translation: “new town”) to Siak Sri Inderapura, once the seat of the Siak Sultanate. Roads in Sumatra are notoriously bad. The boat I was on sped by a regular succession of not only wooden jetties, outhouses, and houses on stilts, but also concrete docks with gantries, silos, gas tanks, containers and tall piles of timber. There are occasional signs of decay - abandoned warehouses, rusty cranes on decrepit timber docks. It is said that cheap air travel has largely killed the passenger traffic between peninsula Malaysia, Singapore and Pekanbaru. But for now at least, this old river route still has life in it. The landscape is familiar -mangrove and thick jungle line the banks, rubber and oil palm, just behind. The country here flat; just outside Pekanbaru it was undulating but since then I hardly seen a hill. There are also timber plantations. In a few places, I saw tall closely planted trees in rows of varying maturity and heights. I found out later at Universitas Lancang Kuning back in Pekanbaru. that they were gum trees - aparently, a local specie of the eucalyptus. Two hours from Pekanbaru, we reached Siak Sri Inderapura, the centre of the old Siak Sultanate which started at the turn of the 18th Century with the murder of Sultan Mahmud Shah II of Johor (a descendant of the Melaka Sultans). His wife, Encik Pong, ran away to Singapore, then Jambi, and whilst on the run, gave birth to Raja Kecik, later to become Sultan Abdul Jalil Rahmat Syah. Raja Kecik did try to reclaim the Johor throne but without success. He then retired to the Buantan region of the Siak river. 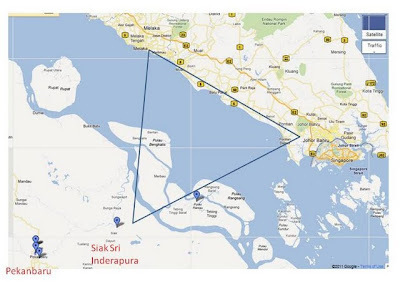 Thus a new kingdom was established with Senapelan (now Pekanbaru), Kota Tinggi, Mempura Kecil and Siak Seri Inderapura being some of settlements in it. It was the 11th Sultan, Syarif Hasyim, who built the palace in Siak Sri Inderapura, which stands just a short distance away from the town jetty where I disembarked. Designed by a German architect in a style that blended Indian, Arab and European influences, it may be grand but not big. It has one big hall in the middle - a sort of throne room - and smaller galleries on all sides. In the front was a reception hall and to one side was the dining. Two ornamental spiral staircases are placed in the room just behind the throne room. Upstairs were four rooms for guests. The Sultan and his family stayed in a modest bungalow next to the main palace. Nearby, is the Sultan's mosque; next to it, the tomb of Sultan Syarif Qasyim, the 12th Sultan of Siak. He was an ardent supporter of Soekarno and declared his Kingdom to be a part of the Republic of Indonesia. He did not have any children. He died in 1968 leaving two wives, but no heir to the throne. 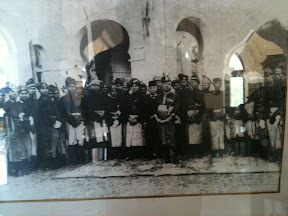 In 1997, the Republic declared the last Sultan of Siak as a National Warrior. I am glad that the Timber Plantation is beginning to embrace the sustainable industry. It will only benefit them in the future. One should really consider these safety tips during any woodwork.